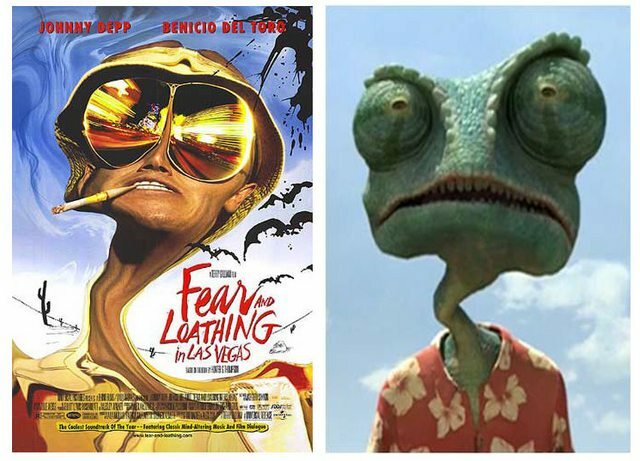 Both are the official posters for the films Rango and Fear And Loathing In Las Vegas, which is a 1998 fantasy-drama film adaptation of Hunter S. Thompson’s 1971 novel of the same name. The film, directed by Terry Gilliam, stars Johnny Depp as Raoul Duke and Benicio del Toro as Dr. Gonzo. Rango’s voice is also by Johnny Depp. Probably there will be more movie connections in the Rango scenes.